Another one of those flabuless full of veggie asian style dishes. I love these because they are almost a one dish meal and when you are in a hurry or lazy from a day of gaming and working out (yay weekends) these are so great! It used to be that when these what we call hungrylazy times would happen we would hasten to the takeout menu file or some sort of fast food might be discussed. Well…times have had to change. This can be thrown together in the same amount of time it would take for a pizza guy to get here or to drive down the hill and pick up something. Hmmm. Looks pretty tasty doesn’t it? It sure tasted better than fast food and left me feeling better afterwards. Sometimes fast food just doesn’t make my tummy happy. Our stirfry had 239 calories and 6.6 grams of fat approximately for three servings. Here’s what we did. Sprinkle 1 tbsp of soy sauce on the sliced beef and allow to marinade for atleast 30 minutes. Combine the remaining soy sauce, hoisin, and red pepper flakes in a bowl. This will be your sauce. Heat your wok or skillet over medium high heat. Spray with cooking spray and add the beef. Stirfry until cooked. Remove and keep aside in a bowl. Add the garlic and ginger to the pan. Stirfry until fragrant, usually just a few seconds. Add the carrots and celery. Add a bit of water to start a bit of a steam usually just a tablespoon or two. Cook for a few minutes until starting to get tender. Add the cabbage and green onions. Cook until desired tenderness. Add the sauce and the beef and stirfry until the sauce has reached the desired consistency. This dish is awesome served on rice or noodles. Don’t forget to count the calories for your side dish. Sometimes we like to add water chestnuts and bamboo shoots to our stirfry. I totally forgot to add them this time. When you do add them the calories for this dish become 266 calories and 6.7 grams of fat for three servings. Completely worth it though for the crunch and slightly bigger portion that leaves you nice and full. 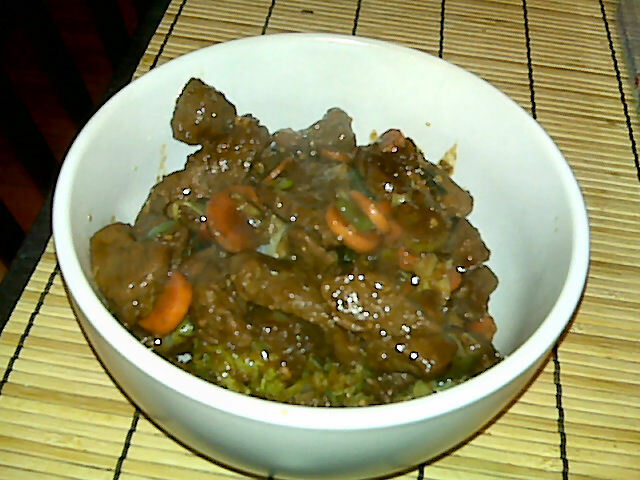 This entry was posted in Dinner and tagged Beef, Stirfry. Bookmark the permalink.